I love that you can watch them make the tortillas! When I moved to Burbank many years ago, a friend introduced me to Chevy's, and I've been hooked ever since. 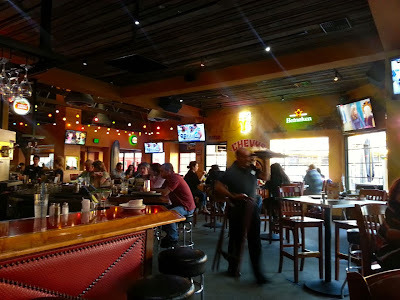 There are a lot of good Mexican restaurants in the greater Los Angeles area, but I have yet to find one that I like better than Chevy's. The prices are great, there's hardly ever a wait, and most importantly, the food tastes super fresh and delicious. I love that they make their own tortillas. I love the decor. I also love that their happy hour is from 2pm to close everyday (at least at the Burbank location). The happy hour change happened a couple years ago. 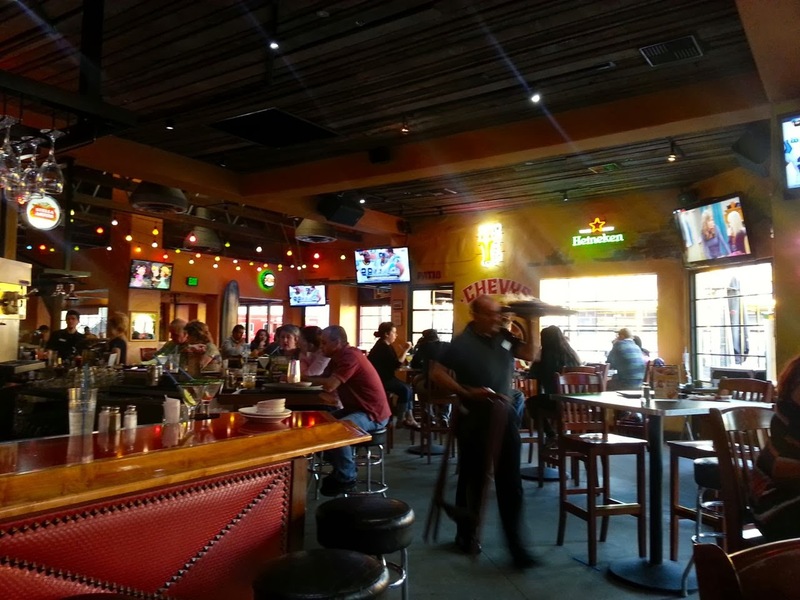 The cantina used to be tiny, and it was almost impossible to find a seat during happy hour (which is where you have to sit in order to take advantage of the happy hour specials). They actually expanded the cantina so that it takes up about half of the restaurant. Now, there's plenty of seating and plenty of time to relax and enjoy your food and drinks. My husband had some friends visiting from Texas a couple months ago, and we met them for dinner at Chevy's. The consensus was that the food was amazing, 2 thumbs up, 5 stars. No one went home hungry, and the food was too good to leave any leftovers. It's just that good. 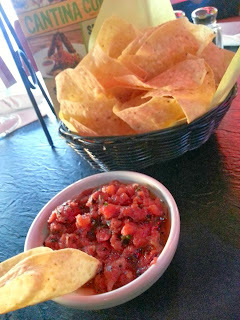 On Sunday, my husband and I were trying to decide what to do for dinner, and when he mentioned Chevy's, I couldn't get their chips and salsa out of my head. I know the chips have 1000s of calories and lots of salt and grease, but there's no point in going to a Mexican restaurant without eating the chips, especially when they're as amazing as at Chevy's. Sometimes you just have to indulge. The chips often come to the table warm. They're light and crispy and lightly salted. They're not thick and hard like they came out of a bag like at a lot of Mexican restaurants. And, the salsa! I love spicy food, so if you can't stand a little heat in your salsa, you may not love this as much as I do. It's not too hot, but it has a nice kick. It's not too watery or tomatoey. It's full of consistently small chunks of wonderful flavor including tomatoes, onions, jalapenos, and cilantro. It's my idea of the perfect salsa, and combined with the chips, it's hard not to go back for more. We sat in the cantina, and of course it was happy hour. Their House Margaritas are only $5 and come in a lot of flavors. 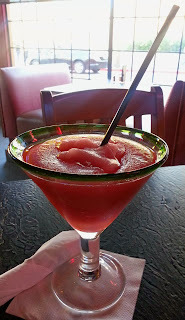 I ordered the seasonal margarita, which happened to be mango, and my husband ordered a pomegranate margarita. 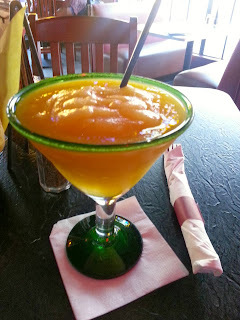 I'd totally order the mango margarita again. It was sweet and tart. I could feel the alcohol a little, not enough to feel tipsy but enough to not care quite as much about how many chips I was eating. The pomegranate margarita was a little too tart for me. It definitely had a pomegranate flavor, so if that's your thing, you'd love it. We looked at the happy hour food specials, and although a lot of things looked good, we ended up ordering entrees. We were too hungry for just appetizers. I almost always order the Fresh Fish Tacos because Chevy's is almost the only Mexican restaurant that makes them the way I like them. Most Mexican restaurants use corn tortillas (which I can't stand unless they're fried), mango salsa (which as much as I love mango, I don't like fruit on my fish) and cabbage slaw (I have a cabbage intolerance). Chevy's uses freshly made in-house flour tortillas, shredded lettuce, pico de gallo and lemon aioli. The type of fish they use is whatever happens to be the fish of the day. On Sunday, it was red snapper. In the past, it's been salmon. Whatever fish they have is always really good. The snapper was no exception. It had a great mesquite grilled flavor. I practically inhaled them. 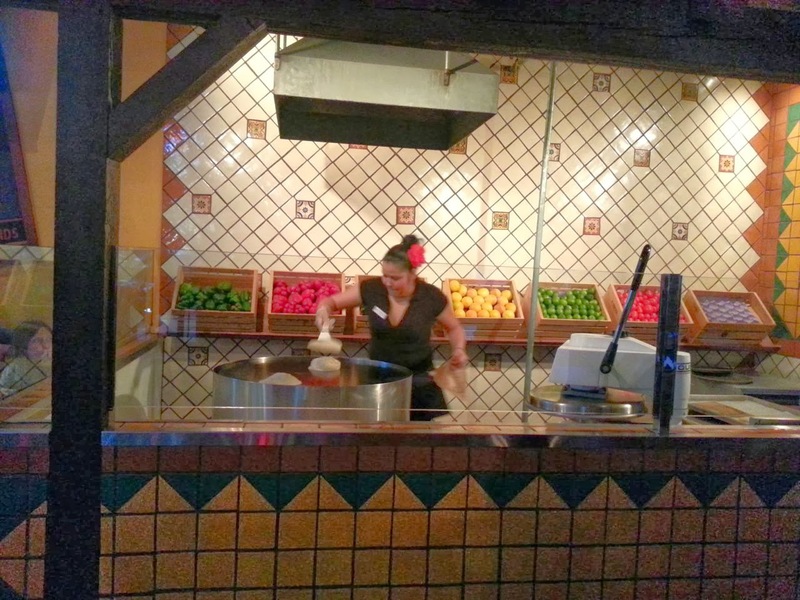 The tacos come with a side of rice and your choice of black beans, beans a la charra or refried beans. I usually go with refried beans because I never make them at home. My favorite side is the sweet corn tamalito. It's like mushy cornbread. Yum! My husband doesn't have a usual, but he usually orders some sort of combo. There's a build-your-own combo option where you can select your two favorites. There are also several pre-selected combos that include three to five items. On Sunday, my husband went for the biggest combo of them all, Chevy's Super Cinco, which is described on the menu as follows: "For those who take Fresh Mex® SUPER seriously! Two enchiladas: one beef, one chicken, a Crispy or Soft Beef Taco, a hand-rolled Pork Tamale and a handcrafted Chile Relleno. You can have it all and eat it too!" 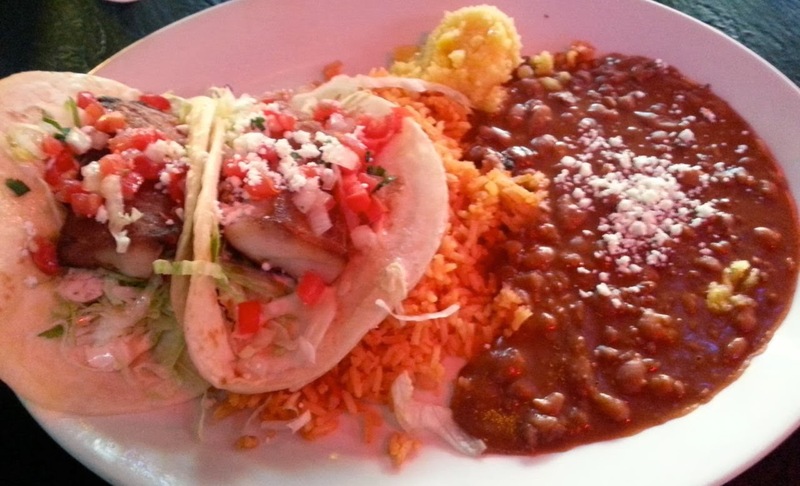 He selected the crispy taco, and the meal also came with a side of rice and beans. It's a lot of food! Two people could easily share this meal, but my husband was hungry, and I barely got a taste. His least favorite was the chile relleno, so I helped him eat that. I mean, it's a pepper filled with cheese; what's not to love? It was especially good with some rice and beans in the same bite. Mmm. Somehow, despite not having any leftovers, we managed to be hungry enough to order dessert. 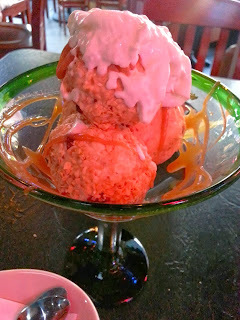 Really, it was just too tempting seeing the card on the table describing the Toasted Coconut Cajeta Sundae, which is described as "Creamy vanilla ice-cream rolled in toasted coconut & candied pecans then drizzled with cajeta caramel sauce." I could see from the picture that it was served in a margarita glass, so I didn't realize just how big it would be. This glass was bigger than the glass our margaritas came in. There were four scoops of ice-cream, which was super thick and rich. It tasted like French vanilla. I usually stock my fridge with low-fat ice-cream, so I definitely noticed how much richer and creamier this was. I love coconut, so the toasted coconut and pecans were a real treat. It was kind of like fried ice-cream but with toasted coconut and pecans instead of the typical crispy coating. We were definitely full by the time we finished dessert, but it was so good we had to finish it! 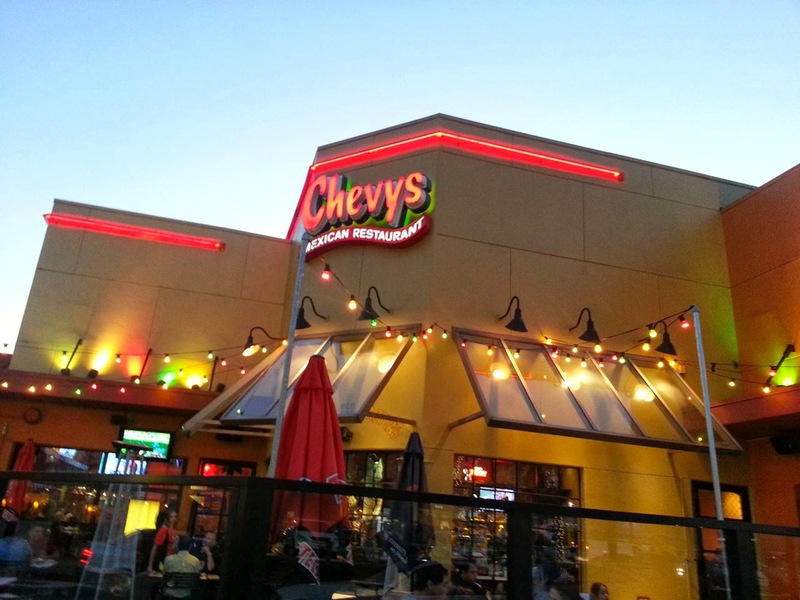 I look forward to visiting Chevy's again. 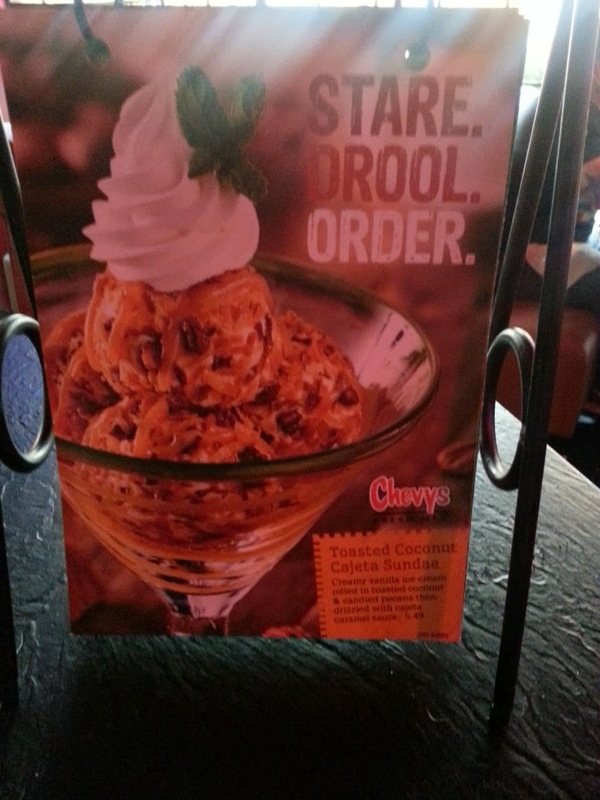 I've never ordered something I didn't like. Their fajitas are great. So are their salads and burritos. They even have options for vegetarians. My husband and I were doing a vegetarian diet for Lent earlier this year, and we found that it was hard to find restaurants that had vegetarian options, but we could still eat at Chevy's. Their Mesquite-Grilled Veggie Burrito is so good. It's described on the menu as "Yellow squash, zucchini, green beans & carrots, trio of cheeses, pico de gallo, vegetarian black beans, Fresh Mex® rice and our super hot salsa in a warm, whole wheat tortilla." Even if you're not on a vegetarian diet, it's a great healthy option...as long as you can stay out of the chips! The veggie fajitas, Farmers Market 'Dilla, Farmers Market Enchiladas, and Cheese Enchiladas would also be great vegetarian options. I looked up the menu online for reference while I was writing this post, and in the process, I found a combo that I just have to try, the Mar y Tierra, which is described on the menu as "A mesquite-grilled Chicken Taco, citrus-chile marinated Steak Fajitas and a Shrimp & Crab enchilada with habanero-pesto cream sauce." Wow, chicken, steak, shrimp and crab all in one meal, and I bet that habanero-pesto cream sauce is amazing! I can't wait to go back! There are Chevy's across the country, so if you don't live in L.A., maybe you can find one in your area using their location finder.